Avril Lavigne called: she said thanks for the tips on makeup and posing. Too soon? A comedy set during World War I – during World War I. Long before Rambo won Viet Nam, Charlie Chaplin won WWI! Writer-director-star Chaplin, the king of physical comedy, addresses the greatest comedy of all – war. Braving public disapproval, he releases SHOULDER ARMS, a breezy lark that follows a Doughboy (Chaplin) through boot camp, trench warfare and combat as a tree (! ), one month before the end of World War I. It was a hit. No wonder. 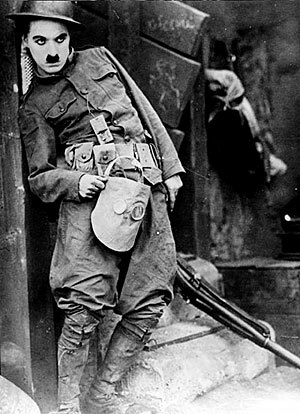 SHOULDER ARMS is not a political statement, just a fantasy of how one scatterbrain British doughboy ends up capturing the German Kaiser himself (played by Chaplin’s real-life brother Sydney) and ending the war. Americans just eat that propaganda for breakfast. In between vignettes that feature Doughboy trying to march in rank, trying to sleep in neck deep flooding, making a life for himself in the trenches by using the enemy’s sniper fire to uncork wine bottles, being a sniper himself, and going undercover to capture the Kaiser, there are broad digs at the German infantry. Every German soldier is made up to look as ugly as humanly possible, and boy are they dumb! And the German troop that Doughboy captures are a gaggle of gentle giants with a malicious dwarf as their commander. When Doughboy is dressed like a tree, he oddly resembles Gumby. Edna Purviance is The Girl whom Doughboy rescues from the clutches of the evil Germans. Yes, Germans = evil. And dumb. No argument from the censors or the audience, all geared – as were their enemies – to regard their opposing side in war as less-than-human. At the end of the short (running time: 45 mins), two soldiers shake Doughboy awake in his tent… Wait– his trials and successes were all a dream? It may seem like a total gyp (was this the first time the Patrick Duffy Shower Scene was shoehorned into a movie? ), but Chaplin may just be saying, the only way to rid ourselves of war is to shake ourselves awake. Message too soon? Or perfectly timed with the end of the war? Starring: Charles Chaplin, Syd Chaplin, Edna Purviance, Loyal Underwood, Henry Bergman, Tom Wilson, Albert Austin, Jack Wilson.